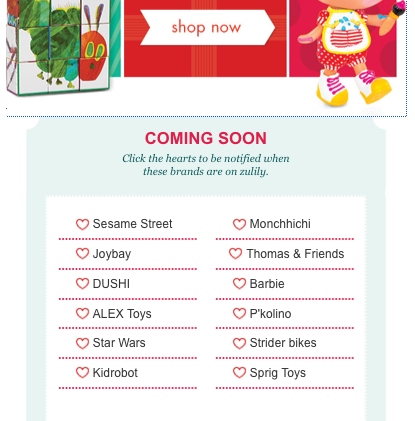 I got this email from Zulily today about a huge toy sale, and it totally caught my attention due to the adorable and recognizable “Very Hungry Caterpillar” that moved across the screen. Here’s a close-up of him inching his way along. I’ve written about clever animation before; I find it to be a very effective method of capturing user attention, particularly when done in a creative way that elicits a smile, like this. They did a good job of just animating one small portion of the email so it didn’t become overwhelming. This small treatment packed a lot of punch! I think Zulily did a great job of making this email very easy and straightforward to take action on. Immediately after clicking a heart, you are taken to a page about that brand, letting you know that you now “love” that brand. No extra steps required; just one click on the email itself. I thought this was a strong implementation of encouraging users to set advanced preferences in a very simplistic and compelling way. My only suggestion was to make the list of brands shown even more well-known, as I was only familiar with about half of these.